How To Wear A Skirt In The Winter + A Sneak Peek At Our Christmas Cards! So as I mentioned on my Instagram yesterday, I just CAN’T handle the cold! And by cold, I mean anything under 70 degrees!!.. Sorry, I’m a Cali girl 😉 haha! But I wanted to mix things up a bit this holiday season, so I thought I’d try to find warm ways to rock a skirt, in December. And while some of you may think highs of 60 and lows of 40 aren’t that cold.. in California that’s COLD! 😉 So I decided to try my luck and paired this black zip-front skirt with a black long sleeve top , a faux-fur stole and a pair of over-the-knee boots! The OTK boots covered basically all of my legs and only left a small area exposed and the faux-fur stole added a warm, cozy layer to my top half! I wasn’t cold at all!! So if you’re looking to wear something other than pants this holiday season, try throwing on some over-the-knee boots and a few layers on top and you’ll be good to go! But don’t forget to pair your look with some cute sunnies too! Even though it’s cold out, the sun is still shining and it adds a little more to the look! And now for the sneak peek!! With Christmas around the corner, I designed some fun Christmas cards with Basic Invite and I can’t wait to send them to mine and D’s families! 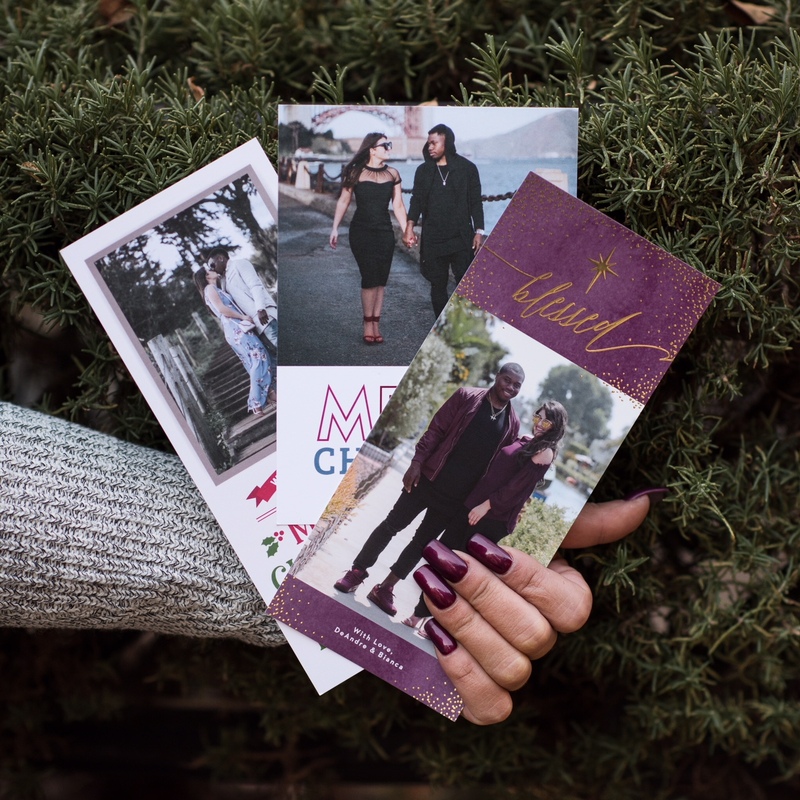 I loved using Basic Invite for our customized holiday cards because we were allowed to use almost unlimited color options and see an instant preview online. They also allow you to order a printed sample of their actual card so you can see exactly how it will look before you order multiples! The pictures below are our samples and they look great! I loved seeing what they would actually look like! And don’t forget to check out my gift guides if you’re still looking for the special people in your life! I have one for everyone, with gifts under $25, under $50 and under $100, as well as a guide for thoughtful gifts! Previous Post Santa Christmas Desserts – Pinterest Inspired! Next Post Gift Guide For Him – All Price Ranges! I love the thigh high boots and that fur! So many fun colors and great styling! you got that right! and thank you!! OMG It’s minus 3 here as I write this and I can barely stand it haha! You look fab and I love the cards! omg! -3!!?? where are you from?? Such a chic winter look! Love the faux fur stole the most! Hey girl! What a perfect winter look! I love the faux fur and those boots! Such a perfect look and beautiful cards! Love this winter inspired outfit! That skirt and scarf are both beautiful. I’m not sure what’s the conversion in Fahrenheit, but we use Celsius here in Toronto. We’re currently experiencing -12 but feels like -19 and in some area -22. I think thats really cold! I do love your fur and I think that would work for me! It’s so pretty and of-course who doesn’t love OTK boots! You look so gorgeous!! I love those thigh high boots so much. And I’m so obsessed with that scarf. Wow ! You’ve styled this skirt so perfectly! Gorgeous boots and love all your accessories! The Christmas cards are amazing! Your outfit is so cute babe! OTK boots are a great way to make skirts work in the chilly winter weather. You’re slaying it! Good post. You totally slay in this mini-skirt Bianca!